Fault finding is good !! Last week, as usual I got up in the morning and walked towards the kitchen to drink some water. Just after five steps, and in a micro second, my legs were up in the air as I slipped badly and then fell flat on my left elbow. It took me some time to realise that the living room floor had water on it. As I nursed my bruised elbow I realised that whole living room floor had a thin layer of water on it. Because of the shine of the floor I could not see water on it. Hearing the sound of my fall Priti, my wife, too rushed into the living room. I told her half jokingly that I did not know that she had created a `Maya palace’ for me and I have slipped like Duryodhana would have slipped when he visited the new palace of Pandavas in Hastinapur. We had a good laugh and we got our act together to clean the floor together. After the whole floor was cleaned I looked back and tried to analyse why did this happen. My mental speculation was that this is Lord’s home and something like this should not have happened. My first thought was that Priti’s niece and her family were here and they might have brought their shoes inside the house and that’s why this thing happened, it was quite a thin argument. Second thought that occurred to me was I did not do `temple marjnam’ at home, as is being done at every Jagannath temple across the country this time of the year, so may be this is Lord’s way to get His this house cleaned ! When I shared my thoughts with Priti she rightly brushed aside my arguments saying that I am trying to find supernatural reasons where non exist. Somehow my train of thought changed as I realised that I am trying to look for all the reasons which others, including Lord Himself, might have created this situation while conveniently ignoring my own self. Then I started looking at my own actions scrutinisingly in last few days and I realised I have done a lot of mistakes in last 3-4 days itself, offenses against Vaishanavas, my own family members and even against Tulsai Maharani!! They all gave me a mild shock. These mistakes, of course, had nothing to do with water on the floor as after some delibration we found the technical reason, one of the balcony drain choked during the last night’s rain and there was some leakage from one of tiles under the glass door. Few months back there was a similar problem in our other balcony which we got repaired but never bothered to test the other balcony too, so it was our fault. I offered my apologies to the Lord for not keeping Their home in good condition as due to my carelessness their home got flooded with water. I also offered apologies for all the mistakes I had just remembered during my quick introspection and promised that I will try my best not to repeat them. 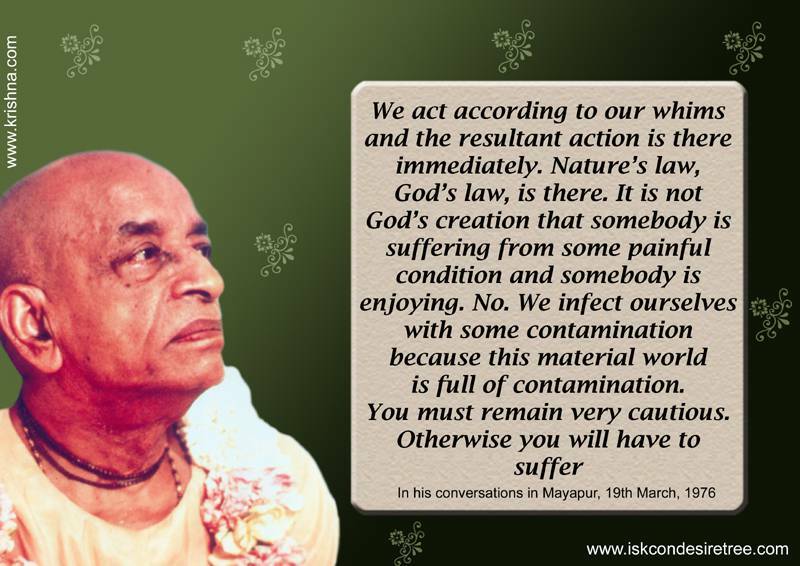 I then begged Srila Prabhupada to kindly bless me with intelligence so that I do not make repeat my mistakes as my own material intelligence is very limited. I felt very happy from inside as I appreciated how much Lord guides us internally to see something positive in each negative situation, this is not at all my normal mode of thinking, rather opposite is true. Just a few months back my normal reactions would have been to first sulk at my bruised elbow, then I would have curtly told my wife to clean the floor herself as I have to chant my rounds first and lastly I would have cursed my civil contractor for the shoddy job done he did and more. My realisation was that whenever something not so good happens to me then without being superstitious I must use that incident to do some bit of introspection and see where all I `slipped’ in my devotional service in last few days/weeks/months. Whatever mistakes I will be able to remember would give me a chance to correct them, not to repeat them and a pretext to reciprocate with guru and Lord. I discovered that fault-finding is good … but only if I do it for my own self (and I must do it periodically). Al glories to Sri Guru and Sri Gauranga. This entry was posted in My realisations, My spiritual Journey and tagged Duryodhana, fault finding, Jagannath, Lord, marjanam, offenses. Bookmark the permalink. ← My report card in Krishna consciousness for 2014. I can so much relate this to myself.